There are several ways to make money though Travel Writing Partners, in fact, you could create your own business through the site, and depending on what "roles" you play, could keep as much as 100% of the Ad Revenue. You might be thinking to yourself, "But I could do that with my own Travel Blog," and, yes, you could. But keep in mind that when you create your own travel Blog, you are solely responsible for the traffic generation and the site will only generate what you, yourself, can drive to it. With Travel Writing Partners, however, you are part of a cooperative, a "crowd sourced" project, where there are many other writers, photographers, videographers, and marketing partners involved... and ALL of them are promoting the site, increasing the traffic exponentially. This means that , not only is it EASIER, in terms of traffic generation, but ALSO that the increased traffic means that we can charge higher ad rates (more money in your pocket) than an individual travel blog could. Additionally, we have more varied content, and more content, than a single, individual, blog, could hope to generate on it's own. Another thing that is an advantage with TWP is that you can do ONLY what you want to do. Only want to create content and refer advertisers, but leave the "sales" to someone else? You can do that. What if you want to work from home, on the phone, but you aren't a writer or photographer? You could make money as a Marketing Partner (by closing our advertising deals), or by working as a "Travel Coordinator" (putting together trips and "FAM" packages for our writers). You can create a business and schedule of your own. Every Ad we sell has 70% designated as commission, and that is divided up between the person who referred the Advertiser and the person who "closes" the deal. They can be the same person. Additionally, any time an Advertiser requests their ad be placed within a certain content the person that created that content receives 30% of the Ad revenue. This means that if you create content, AND you also sell the advertising in that content, you receive 100% (minus a 5% transaction/processing fee). What if you are a "reporter" who turned the information over to a writer, or to the site itself, to be written? In that case you, and the writer, would split the 30% "Content Creator" revenue. Of course, you may also have turned over several leads for advertising that we closed deals on. In that case you would also have received the 30% referral commission. Scenario A: You created content (wrote an article, took photos, made a video) AND the Resort you wrote the story about wants an Ad placed on the same page as your content. You direct them to the page to sign up for the advertising and walk them through sign up. You "closed" the deal (and there was no outside referring person, so you get ALL the advertising commission. Because you BOTH created the content, AND sold the ad, you get 100% of the Ad revenue (minus a 5% processing/ administrative fee). (same for renewals and most ads run till cancelled). Of course, some ads might run quite a while, so this could turn into thousands. Scenario B: You created content, and referred a couple of businesses that said they would be interested in getting information about advertising. You were the "Referring" Partner in this case because someone else then contacted those advertisers, answered their questions and got them to sign up. 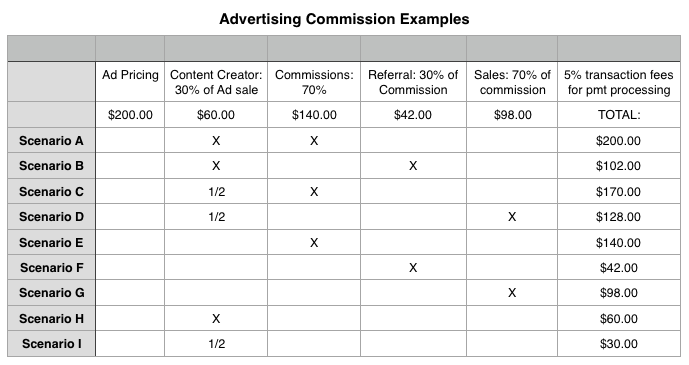 In this case you get the "content creator" 30% and also 30% of the advertising commission for referring. If just one of them closed and it was a $200 ad: $102 for you (same for renewals and most ads run till cancelled). Of course, some ads might run quite a while, so this could turn into thousands. Scenario C: In this case you didn't write the article, but you were the "Reporter" on assignment. You collected the facts, did some interviews and turned your notes over to TWP where a writer put it together for publication. However, while you were on assignment, you talked to several businesses and, later, you followed up by calling them and showing them how to sign up for the ads. In this case you get half of the "content creation" commission and all of the advertising commission. If the Ad was $200, that is $170.00 to you every time it runs, and most ads automatically renew until the advertiser cancels them. Scenario D: You were either the writer, or the reporter in this case. You took the time to call up several businesses, or perhaps chatted with them in the process of doing the story. After the story was published (or maybe even before), you followed back up with them and walked them through how to sign up for their Ad on the website. In this case you will get half the "creator" commission and ALL of the Advertising commission every time the ad runs (and most renew automatically). Scenario F: You and your spouse were out to dinner and happened to chat with the Owner who expressed an interest in advertising. You mentioned you could have someone contact him and got his business card. The next day you passed his information along to TWP so someone could follow up. Also, because your dinner was a part of your travel business, you made a note to write it off on your taxes and you filed the receipt in your "tax shoebox" when you returned home. You made 30% of the Advertising commission for the lead. Scenario G: In this instance you are working from home as a "Marketing Partner" closing advertising deals. You got an email from TWP with two referrals for Advertising. You jumped on the phone and contacted the businesses, following up also by email. One you were successful in getting signed up right away so you get 70% of the advertising commission, while the person who referred it got 30%. If the Ad was $200, that is $98 to you and $42 for them. Most ads automatically renew until the advertiser cancels them and you also receive commission on renewals. Scenario H: You wrote a great article about visiting the Zoo in your hometown. Later the Zoo, and the restaurant across the street, bought Ads and they both requested they be placed on the page with your story. You would get the 30% "content creator commission." Most ads automatically renew until the advertiser cancels them and you also receive commission on renewals. Scenario I: You agreed to write up an article based on notes one of the "Reporters" sent in. The Reporter sold several Ads to businesses they met while "on assignment" and they all requested their ad be placed on the page with your article. You would get 1/2 of the "Content creator" commission for each of them. Most ads automatically renew until the advertiser cancels them and you also receive commission on renewals. Automatic Renewals means your work creates "residual " income. While, ad costs are purposely kept low, we also require most advertisers to sign up on a subscription basis, meaning that they continue to get charged until they cancel the ad. This means that we don't have to keep going back to "resell" them, and that it's more likely they will continue advertising with us. Of course, it's important to make sure that advertisers see a "bang for their buck" and YOU can help with that by promoting our advertisers, as well as the pages they are advertising on, on social media. If we ALL work on promoting the site, it will increase TRAFFIC, it will get ADVERTISERS a better "bang for their buck" AND it will then result in more money in YOUR pocket because we can increase Ad Pricing as we grow. How can YOU help? Promote BOTH our feature stories AND our Advertisers on your own Social Media! You don't have to spend a lot of time, just 3 postings a week, multiplied by ALL of us, will bring big results! For example.... If I wanted to promote Dexters, I might post something like this on Facebook... "Have you eaten at Dexter's recently? I absolutely LOVE their Eggplant Napolean, in fact, it's hard not to have it everytime I visit, though I know everything they do is fabulous. We're so happy that Dexter's is an advertiser in Travel Writing Adventures. You can see them featured here... (then post a link to the page their ad is on) #Dexters #Orlando"
#Hashtags are great to add for ALL social media. They used to just be for Twitter, but now other social media (like Facebook, Tumblr, Google, Instagram and Pinterest) have worked hashtags into their search functions and they will BOOST visibility and assist with "Reputation Management." I always recommend adding a #Hashtag for the CITY or area, the subject of an article, and the name of an advertiser. Reputation Management is a marketing term that describes the effort that businesses must make to keep their online business image and reputation POSITIVE. One of the reasons business are engaging with us, and one of the benefits we can offer a business, is the POSITIVE coverage we can provide to them. Sadly, with "review " sites like Yelp, Google and TripAdvisor, businesses can be damaged by bad reviews that are not deserved. ANYone can create a fake screen name, or account, and post negative stuff about a business... even their COMPETITORS. This does happen, along with customers who are cranks, jokesters, those that are overly picky, or those that just fancy themselves some kind of "critic." Heck, I once saw a reviewer completely TRASH a restaurant simply because they had to wait longer than expected for their food and the server forgot their lemons. 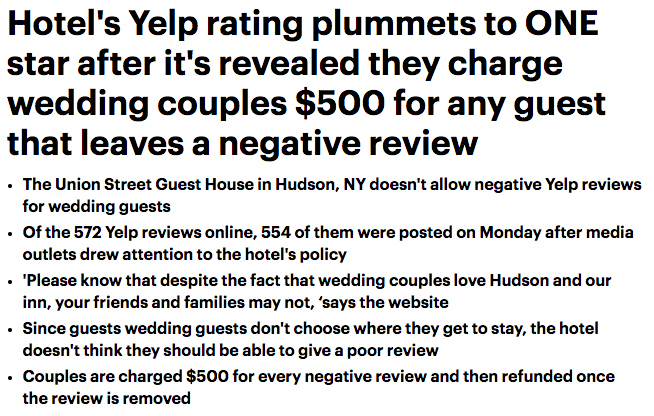 Those were the ONLY legitimate complaints they seemed to have, yet it prompted them to write a scathing review, calling the place "unprofessional" and giving them 1 star. Those of us that are are sophisticated consumers know that any restaurant can be a bit slow when they are busy and any server can forget one item. We would not write a damaging review because of it, but there are those out there that are never happy with anything and enjoy being "trouble makers." OUR positive feature stories can help a business counter any bad Reviews. By using #Hashtags with the businesses name, you can help potential customers searching for information on that business, to find our stories easily. Research shows that consumers are increasingly using search, not just on Google, but also on Social Media to check into a business before going there and, when a customer has REALISTIC expectations of a business they are less likely to post a negative review. Additionally, they are more likely to enjoy their experience because it is inline with what they thought they would encounter. Does that make sense? To conclude... there are several ways YOU can make money here, and the MORE you engage, the more you help out with marketing the site on your own Social Media, the MORE money we all will be making down the road. This is a CROWD SOURCED project and, when you are a MEMBER of Travel Writing Partners, you are a PARTNER in the revenue it generates!